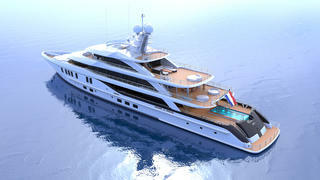 Dutch superyacht designer Nick Mezas has revealed his latest concept, a 74 metre motor yacht for the renowned Amels yard. Former Young Designer of the Year finalist Mezas explained that this design aims to provide long-distance cruising in complete comfort. Accommodation on board is for up to 12 guests, including a dedicated owner’s deck measuring 240 square metres. 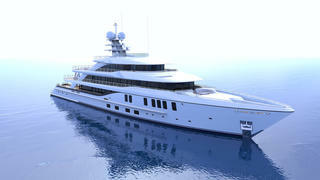 This area would feature his and hers en suites, walk-in wardrobes and a private superyacht office. A pair of main-deck VIP cabins and three lower deck doubles complete the guest accommodation. Mezas adds that he paid close attention to creating great views out to sea — for this reason, the design features low beamy bulwarks and slanted knuckles in the bridge deck and sundeck. Other key features include a 180 square metre aft deck, complete with bar, dance floor and 6.5 metre infinity pool. Moving up to the bridge deck, there are options for shaded seating overlooking the bow and an aft-deck sunbathing area, which doubles as a superyacht helipad. The sun deck features further relaxation space for soaking up the sun, as well as a Jacuzzi, while the superyacht beach club includes fold-out terraces and a full-beam wellness centre. If built, this 74 metre Nick Mezas design would rank as the fourth largest Amels, behind Boadicea, Montkaj and the recently launched 83 metre flagship Here Comes The Sun.